Bear Ridge. Bear Ridge. Bear Ridge. We had probably built this climb up in our minds to be the equivalent of climbing Everest. Of course, I’m over-exaggerating, but there was some legitimate dread. At least when climbing a pass, you’re (usually) rewarded with a spectacular view that ends with a decent amount of accomplishment. Instead, this climb would involve 2000 feet and 4 miles of, well, walking. No incredible view, not even getting to cross an official ‘pass’ off the list. Though, I was grateful I would have it out of the way before the day had barely started. It’s 6:00am – here we go. Actually I wasn’t out at 6:00am, but pretty close. Slippers was up with me before 6:00, but he hustled straight out of camp to get up the hill. I took a little more time eating breakfast, and was out of camp around 7:00 When I left, Friz was barely up and about, and he was making a point not to rush. With the glacial pace I tended to walk uphill at, I figured he would probably catch me. We truly did end up camping at the last spot before the climb, because the trail just past our camp quickly began to climb up the switchbacks. I had been hoping to occupy myself with resuming listening to Game of Thrones Book 3 audiobook on my climb (as I had discovered, it was an excellent way to preoccupy my mind during long, dull, uphill climbs where I would likely otherwise be repeating to myself something like: “I’m walking uphill. I’m still walking uphill. I’m still walking uphill. I’m going to be walking uphill forever for the rest of my life”). Unfortunately, though, the iPod charging cable I bought at Walgreens in Mammoth proved to be expensive dead weight. And my iPod was now long dead (additional dead weight). So, it was just me and my thoughts, and 3.9 miles of dusty switchbacks. But, despite this, I was actually feeling super positive and good! Yesterday had been amazing, and I was feeling like today would be another good day. If all went as planned Bear Ridge would be behind me by 9am, and I would have a leisurely day ahead. It proved to be a beautiful morning – cool enough that I held my trekking poles with gloved hands, but not too cold. I walked through a stand of flickering aspens, and the forest around me was loud with the chattering of morning birds. The switchbacks wound up the hill. A view of the rising sun on the rock walls across the valley opened up shortly. My breathing was typically pretty tough on climbs, but it was always easier when I hiked at my own pace rather than trying to keep up with others. Pushing myself at someone else’s pace seemed to get me in trouble. But this morning, I was the only one around – Slippers somewhere long ahead of me, Friz somewhere long behind. I stopped to shed layers and catch my breath a few times, but overall, it ended up being truly not nearly as tortuous as I had anticipated. Friz continued on to look for Slippers. I took my time gathering my crap, and then wandered forward figuring I would meet up with the guys somewhere later that day for lunch. They actually ended up being only probably 500 feet down the trail waiting for me, (looking extremely bored of waiting – I had no idea they were waiting for me, so I was in no hurry). They were also bummed, because they had not been graced with the good fortune of cell phone service (for those wondering, AT&T turned out to be the winner, by far, when it came to service out there). Fortunately, I still had service, so I let them use my phone to make calls to friends and family to let them know they were still alive, and that their schedules had changed. Onward we marched for a few easy hours. I had begun to notice something quite interesting about my thoughts while walking – largely that there were none. Put simply, I wasn’t thinking. Not in the sense that I was mindless, but that my mind, which was normally racing with at least 40 different internal conversations, was oddly silent. I had assumed before embarking on this trip that with all of the miles, and days, and hours in front of me, that I would have more than enough time to contemplate many things. Perhaps I would discover answers to some of life’s big questions, or reach some epiphany. I had actually prepared a small list of things I wanted mull over. I’m pretty sure I got to none of them. Once I became aware of what was going on (or, rather, the lack of what was going on) I began to challenge myself to think about things. It didn’t work. My mind would not hold onto anything. Like the passing clouds of thought that are often referred to when learning to meditate, non-essential thoughts were drifting on a breeze right out of my mind. Maybe this whole thing was a moving meditation. For the most part, the only things my mind was willing to invest any energy in were those inherent to my survival, and the current moment. Wondering where the next water would be, walking, food, sleep, miles, walking, maps, snacks, walking, weather, don’t die, and a whole lot of “Gee, this sure is ridiculously pretty”…that was it, that was all I my mind was able to put any energy into. It was as if I had subconsciously shifted into some sort of instinctive survival mode. Thinking about work, or when my car might need an oil change, or whether or not I should take up playing the cello when I return – these things weren’t going to get me through the wilderness, so I suppose my brain couldn’t be bothered with them. It was truly fascinating (but not that fascinating, because even thinking about my lack of thoughts wasn’t something my mind would ponder for too long). Though, a sappy thing would happen. Whenever a thought of my husband entered into my mind, for even the most brief moment, I would feel near tears welling up. Even then I didn’t know why. Sure, I missed him – but, honestly, not enough to warrant crying! It was just an overwhelming feeling of love and gratitude that came over me – so overwhelming that I tried not to think about him (geez, that sounds horrible, but I promise, it’s not) because it brought up such crazy, choking, feelings. Crazy, choking, feelings were not going to get me through the wilderness! What if I tripped and busted my head open because of blurred vision due to sappy husband-induced-tears? Nobody wants that. When the sun was high, and the heat of the day had started to kick in, we found a perfect spot along Bear Creek to stop for lunch. It was one of my favorite lunch spots – the low river of late summer gave us some granite slabs that were ideal for lounging and napping. Our shoes came off, eyes were closed, snacks were had. It was quite perfect. I remember vividly asking Friz what day of the week it was, who then asked Slippers, who also had no idea – and all of us spending a good few minutes trying to figure it out until someone turned on their phone and cheated. It was Saturday. It was Saturday, and it didn’t even matter. I was first to head back to the trail from our lunch break. The remaining miles for the day were short, but uphill, and I wanted to get there early and have time to relax. The trail followed Bear Creek up river under a canopy of conifers – I was thankful for the cool shade. Not too far up the trail I had to cross Bear Creek. This late in the season it was nothing more than a rock-hop…but I had read that in the early summer, it can be a very dangerous crossing. It was getting incredibly hot again. I decided to stop and drink a liter of water (because I had neglected to do so over lunch), and while I was drinking my water Friz and Slippers arrived. They joined me in hydrating, and somehow it turned into me giving Friz a refresher on how to do a Sun Salutation, and us – hands in the dirt – rolling into Downward-Facing Dog in trail runners on the shore of picturesque Bear Creek. Slippers looked on, likely thinking the whole thing was ridiculous. The uphill march to Marie Lake resumed – all of us nicely hydrated. The sun was draining and it was incredibly hot. We all went ahead at our own pace, each hiking alone. It was an unsuspectingly tough climb. Essentially, we were actually climbing Selden Pass, as Marie Lake sits only 300 ft. below the top of the pass at 10,551’. I don’t think we really realized until we were in the thick of it, that we would be doing Bear Ridge and (most of) a pass in the same day. It honestly wasn’t that bad of a walk – but the heat made the climb tough. My umbrella was back up. The trail leveled out for a bit at Rosemarie Meadow, which was quite beautiful, with Mount Hooper in the distance. Meadows like this are the reason I hope to do this trail again in the early summer someday, when grass is green and wildflowers are everywhere. Even in her fall colors, this meadow was very pretty. The climb began again, steeply, out of Rosemarie Meadow. The lake surely had to be close, though my False Hope kept tricking myself into thinking it had to be right there. Nope. Right there! Nope. Good Lord, where was this giant lake?! Finally, I rounded a corner and there she was. Beautiful. Marie Lake was a true, true, gem. She had such a unique shape, with small, scattered, islands, and clear sapphire water, sitting right at the edge of the alpine zone with sparse stunted Whitebark Pines and alpine meadow around the shore. It was my favorite lake of the trail. We knew from Wenk’s John Muir Trail guidebook that the campsites here were few, and I was not seeing any obvious ones. I kept walking down the trail along the shore of the lake, but the trail quickly started climbing away from the lake, so I knew I had unknowingly passed the few spots there were. I saw a spot that could work for one tent, but not for three – I was starting to feel frustrated. I just wanted my pack off my back. I saw Friz walking toward me, coming back from walking further up the trail looking for campsites. He was equally frustrated that the spots were so hard to find – we both were ready to be done hiking for the day. I walked back to the lake outlet and decided to just drop my pack, rather than carry it around while we searched for a spot. Finally, after hunting for quite a while we found an area that could accommodate 3 tents, and quickly staked our claim. While walking to get my pack, I found Slippers and led him to our site. This camp rivaled our spot at Garnet Lake earlier that week; our tents were perched up on a granite slab with 360-degree views of the lake and surrounding peaks. This was the Sierras at their finest. The wind was picking up, and I was having a hell of a time setting up my tent in the sandy soil (my stakes would not stay down, so I ended up having to tie off to rocks. While battling with my stakes, I heard Friz and Slippers yelling for me. I was completely surprised to find them swimming in the lake! Friz made it known that he does not swim in lakes, and I knew the water had to glacially-cold…so, they begged me to document this rare experience before hypothermia set in. Of course, I then had to get in, too. Holy crap, it was cold! I didn’t make it in nearly as far as they did, but it was still super refreshing. The wind was really picking up and the temperature was dropping quickly. We all dried off and changed into warmer clothes and then met up in the middle for dinner (“the kitchen”). While making dinner, I noticed that a bandage I had wrapped around a hot spot on my pinky toe the day before was coming off from having been in the water. So, I grabbed some fresh tape to re-wrap it in (because isn’t it both incredibly normal and appetizing to pick at your feet while you make dinner?). I pulled off the old bandage in shock and amazement. So shocked that I had to immediately call the guys over to see. I HAD GROWN A NEW PINKY TOE. Well, not really, but I did suddenly have a blister the size of my entire pinky toe. So large, that there was no way this thing would fit inside my toe socks again. Of course, the one day I hiked in normal socks this happened. I had been hiking every other day in toe socks to specifically prevent blisters like this (and had until this point avoided a single blister), but today, for some dumb reason, I chose to hike in the ‘normal’ socks I usually wore to bed and the friction of the tape I had used to wrap my toe must have been rubbing weird all day without me noticing. I was amazed for as ugly as the thing was, that it didn’t hurt at all – but now it was pertinent this blister didn’t pop too early and that I avoided infection. When Friz saw it, he said, “Wow! Make sure you take a photo of that.” So I did. See that blister peeking out on my right pinky toe? That’s my new 6th digit. Overall though, not too bad for 100 miles of backpacking. So, I wrapped up my new 6th digit as if we were going into battle, and returned it to the safety of my camp shoes. We all huddled over our dinners to stay warm, and planned our glorious day tomorrow. Tomorrow would consist of hustling as fast as our human legs would carry us, the 10 miles to Muir Trail Ranch for the night. I was determined to pull my first “10 before 10” (10 miles before 10:00am). 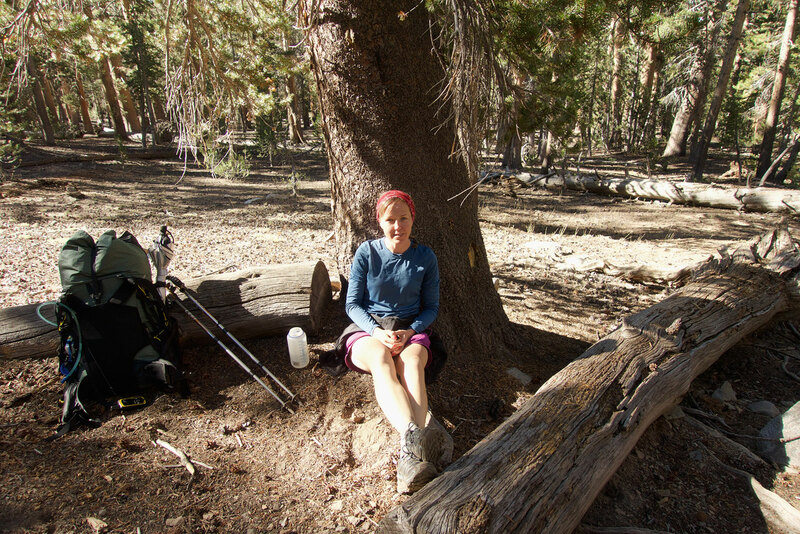 Actually we had been gushing about Muir Trail Ranch all day. My last resupply bucket was there, waiting patiently for me! There would be treats, and new socks, and a cabin all to myself, and laundry, and a shower, and electricity to charge batteries, and hot springs, and real food. Oh, my! Neither of the guys had booked a cabin there, but they were now hoping there might be one available for them to share (after listening to me go on and on about it for the past few days). It would also be Friz’s birthday the day after tomorrow – so a night in a cabin, with a fresh cooked meal and a hot springs would make for an awesome birthday treat. I was crossing my fingers for them that there would be room! We stayed outside for as long as there was light, and wrote in our journals, and read. While looking over maps we realized we had hit a big milestone – we had hit 100 miles! 100 miles felt like an awesome accomplishment. When our fingers and faces could no longer handle the bitter wind, we turned in for the night with visions of hot springs dancing in our heads. Nicely written! Looking forward to the rest !